Everyone is probably familiar with Venice, slowly sinking below the Adriatic. But, did you know the city of Jakarta, Indonesia is also sinking? The BBC published an informative article about the city’s looming problem and the piece includes several nice graphics. 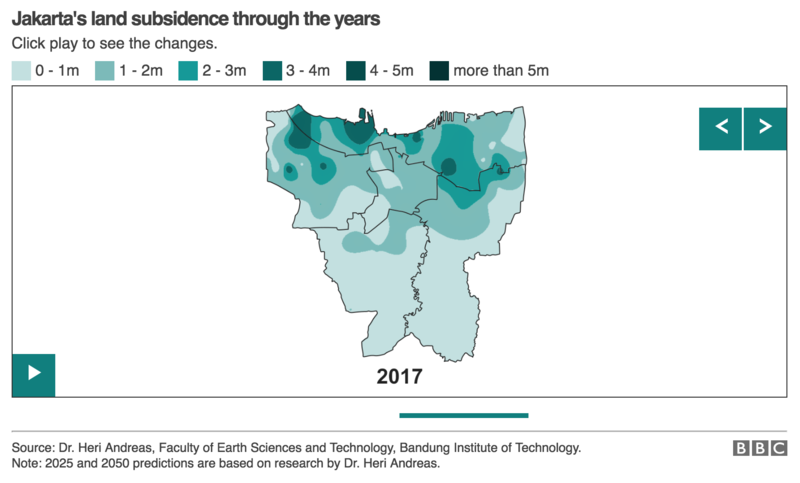 The screenshot below is an interactive timeline of the amount of subsidence, or sinking, in the the Jakarta region. It’s been notably worst along the coast. But the striking part are the forecasts for 2025 and 2050 that place the city in danger. I was aware of Jakarta’s peril, but until reading this article, I had not realised just how imperiled the city really is.